Royal Jelly is an extremely nutritious, thick, milky-white creamy liquid secreted by the hypopharryngeal glands of the nurse bees. Royal jelly produces an age-retarding, longevity enhancing effect. It helps maintain health, beauty, and youth; helps normalize body functions; protects against infections; increases resistance to diseases; and increases endurance and energy levels. It is antibacterial and anti-viral, particularly against streptococcus, E-coli, and staphylococcus. 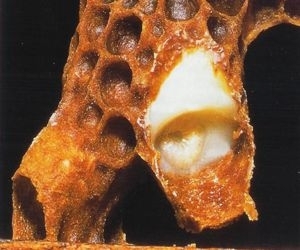 Royal jelly accelerates the formation of bone tissue and helps heal wounds in half the time. Like bee pollen, it is a rich treasure chest of nutrients and energy. It is 12-13% protein, 12-15% carbohydrates, 5-6% beneficial lipids, including the important fatty acids, and contains the full spectrum of vitamins. Royal jelly is high in the B vitamin pantothenic acid, recognized for its ability to reduce stress levels. It supplies the minerals calcium, copper, iron, phosphorous, potassium, silicon, and sulfur. Royal jelly contains sterols, phosphorous compounds, and acetylcholine. Acetylcholine is needed to transmit nerve messages from cell to cell. Too little of this compound makes individuals prone to various nerve disorders including Parkinson's disease, Alzheimer's, and Multiple Sclerosis. Royal jelly is high in amino acids which are necessary for human and animal life. It contains at least 17 amino acids, including the 8 essential amino acids, plus 5 unidentified related compounds. Aspartic acid is a major amino acid-necessary for tissue growth and building-at 16.1% of the royal jelly protein content. It contains the amino add gamma globulin, which helps your immune system help fight off infections. Half the total fatty acid content is 10-hydroxy-2-decanoic acid (10-HDA) which is involved in growth, regulation, and immunity. 10-HDA comprises 2-15% of total weight of whole royal jelly. Royal jelly also contains pheromones and numerous other identified and unidentified substances. Royal jelly is available alone as a pure jelly-like substance that should be kept in the refrigerator or freezer. It is also available in honey, which acts as a natural preservative, or freeze-dried (lyophilized) and available in capsules, tablets, chewables, as well as combined with other natural substances such as other bee products. It is available as a liquid, often again mixed with honey. It is also used in cosmetic and skin care products, and is available in creams, salves, ointments, and other products.